We were looking for a bit of comfort last week, our spirits sagging from the cold and rain, and decided to stop into Café Polonia for lunch one day. It was definitely the right decision. The bright, welcoming atmosphere and hearty warming food were just what we needed. Cafe Polonia is the second location of the Dorchester restaurant known for its traditional Polish fare. The Salem location, which opened in October, not only features Polish foods, but German, Hungarian and Eastern European specialties as well. We settled in with a Tyskie (a Polish lager, $5 for 500ml bottle) and ordered the potato pancake sampler for two ($8) to start. This plate could easily have been our entire meal, with four huge potato pancakes served with sides of sour cream, a chunky apple sauce, and a bowl of Hungarian goulash. The pancakes were fresh and crispy, and the goulash was delicious: rich and hearty with hunks of tender brisket and vegetables in a savory gravy. 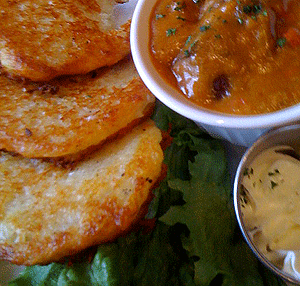 We ended up ladling the goulash over the pancakes and eating them together—comfort food heaven. We didn’t really need another bite, but we soldiered on as we had already ordered the Polish plate and the Pyzy dumplings. 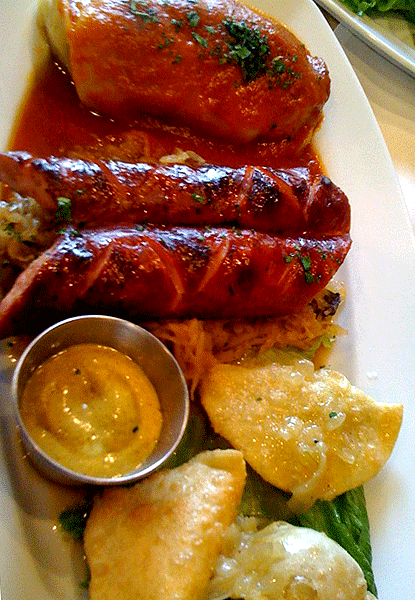 The Polish plate ($14) was a sampler of traditional tastes, and once again, enough food for several people. The pierogies were lovely, delicate and crisp on the outside and stuffed with savory filling. We tried the meat, potato, and cheese and the cabbage and mushroom, all very satisfying. The kielbasa was excellent, and the hunter’s stew, made from various sausage, pork, cabbage, and sauerkraut was interesting, almost Alsatian in taste. The stuffed cabbage was quite respectable as well. The Pyzy dumplings ($14) are meat-filled potato dumplings served with caramelized onions. The dumplings steamed rather than fried, so the thick jacket of potatoes can feel a bit gummy, but the filling of ground pork and spices made a tasty counterpoint. There was so much food that we ended up with a meal’s worth to bring home, and there was no way we had room for dessert. We’ll have to try the apple crisp or the chocolate babka next time around.